Whoops! Maybe you were looking for sexual chocolate? Hello. I will be escorting you through the magical journey that is the Thin Mint. Please hold your applause until the end. Ahh, the Thin Mint. Truly one of society's greatest mysteries. A delicious snack in any form, and, though this fact is unrecognized by many, and simply shunned by others, it does come in multiple forms. In this case the term multiple only refers to two, at least, only two that are currently known to the common man. Please join me on this fine journey through the magnificent and quite unbelievable world of the Thin Mint. 1 So, What Is This "Thin Mint" You Speak Of? 2 There Really Is More Than Just One Type Of Thin Mint? 3 Anatomy? Why, That's Preposterous. How Can There Be Anatomy Of Candy? 4 Hmm, Interesting. Is There, By Any Chance, A Third Thin Mint? So, What Is This "Thin Mint" You Speak Of? Oh, an inquisitive mind, I see. Well, let's see. While the Thin Mint's original date of creation is not recorded and, therefore, is not known by anyone in modern day society, it is believed to have been first invented in the mid- to late-12th Century in what is now York, Pennsylvania. (Please note that although it contains a deliciously chocolate taste, the Thin Mint, in fact, has nothing to do with the infamous Hershey company.) It is a fact, however, that the term "Thin Mint" is derived from the Latin phrase, Athinan Menta, which literally translates as "discular sugar of cocaic protection". This being said, just from the title, it is horribly obvious that the Thin Mint would be an illustrious delicacy, but there is controversy. The fact of the matter is, there is more than one type of Thin Mint. There Really Is More Than Just One Type Of Thin Mint? Oh, of course! The Thin Mint market has been split for as long as I can remember. Split right down the center between Necco and the "Girl Scouts." Perhaps we should take a closer look at their anatomies now. Many people believe Necco to be the original creators of the Thin Mint, despite the larger popularity of the "Girl Scout" Thin Mints. However, as previously stated, there is no proof of the exact times that either was made, so there is no way to be sure. I am absolutely positive you would like to know more about these viciously competing companies. 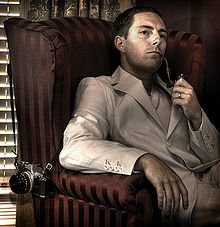 One thing many people are confused over is the inclusion of Haviland. What is this Haviland, and could it have something to do with Necco's sudden rise from failure? Necco. A most peculiar company. Being the maker of the infamous "Sweet Heart," a candy made from children's sidewalk chalk to increase the "playfulness" of the candy, Necco has suffered much demeaning ridicule. And yet, somehow, the humiliated company created their version of the Thin Mint. One of life's true miracles is how the ingenious creation of this snack saved a quickly failing company from total destruction. Nobody is sure how they were given the idea though. The company clearly did not have the intelligence or skill to come up with this idea on their own, so it is baffling to see the production of the Necco Thin Mint. Though officially entitled as the "Woman's Cocoa Cookie Corporation of America," the WCCCA is most often referred to as the "Girl Scouts." These Girl Scouts were a decently unknown group until about 1983, when they coined the name Thin Mints. Surprisingly, the copyright conflict between them and Necco went unnoticed and no charges were filed. If they had been, it is likely that the current issue would not exist, and there would be only one Thin Mint. Yet that is not what happened, and now there is a new conflict to be dealt with. Yet to truly understand this situation, one needs to take a close look at the anatomy of the two Thin Mints. Anatomy? Why, That's Preposterous. How Can There Be Anatomy Of Candy? Ahh, how indeed. While you are quite the inquisitive chap, you are quite misled in believing that this modern marvel is nothing more than simple candy. You see, the Thin Mint is so much more than that; it should never be lumped into the same category as petty candy. Yet they become even more amazing when you realize that the two brands of Thin Mints truly are significantly different. Although it may seem so, this is, in fact, NOT a Thin Mint. Thus, the controversy begins. Necco, despite its many other failed attempts at snack-food success, has, in some consumers' opinions, perfected the Thin Mint. The Necco Thin Mint is known for its extremely familiar taste. Some argue over the validity of that statement, stating that the Necco Thin Mint is a fully original idea, but this comes into question when one analyzes the York Peppermint Patty, or YPP as it is referred to by the manufacturers in San Jose, Mexico. When one splits a Necco mint down the center, they will see a white, creamy substance coated with a very thin chocolate layer. The cream is in fact composed of pure mint. The controversy comes in when a YPP is split beside it, revealing almost the exact same image, only doubled in size. While chemical analyses have proven that the mints are composed of slightly different materials, the relationship is apparent. Notice the use of green. Many are puzzled by why delectable snacks would come in an unappetizing green box. However strange of an idea it may be, it does not distract one from the taste of the Thin Mint. The Girl Scout Thin Mint is by far the most popular brand of Thin Mint. Perhaps it is because of their door-to-door marketing campaign, their employment of young children as saleswomen, or just their brand recognition. Regardless of the reason, the Girl Scout Thin Mint is quite an anomaly. According to 2008 statistics, the Girl Scouts, currently the largest cookie manufacturers in America, have gained more profit from their Thin Mints than from any other cookie, despite, or perhaps, partially due to their controversy. With such a vast selection, it is shocking that the Thin Mint has sold so much. Of course, a in-depth look needs to be taken of this phenomenon. The Girl Scout Thin Mint, when split, does not contain a minty gel. While the chocolate coating remains the same, the inner workings are vastly opposing. 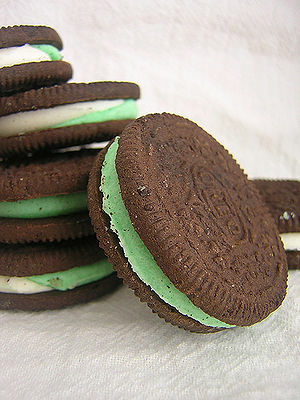 In place of the mint cream is a type of chocolate cookie, only the cookie is not made of chocolate per se. Scientists are baffled by the cookie. None can figure out just what the cookie is made of, as it is not a cookie like any other in existence. However, the bigger mystery is shown by the chemical properties of the cookie. Apparently, it has the properties of rich chocolate, but it gives off a purely mint taste. Now, this all does not necessarily place the Girl Scout Thin Mint ahead of that of Necco in terms of quality, but it most certainly does serve as a greater twist of the imagination. Hmm, Interesting. Is There, By Any Chance, A Third Thin Mint? This cookie, made by Oreo, was assumed by many to be the 3rd Thin Mint, though tests have proven otherwise. Hey, watch your tongue boy! Don't just go shouting that up on the mountaintops! That is real "Hush Hush" information, understand? No knowledgeable person would ever even think about that idea without making sure it is absolutely safe to do so. Aw, now it seems you have gotten me into somewhat of a pickle. I am sworn to secrecy, but you really do seem like an intrigued young lad, and I want you to experience the full journey of the Thin Mint, which can not possibly occur without examining this possibility. Hmm... I suppose I could let you in on it, but this is highly protected information. Do not repeat this to anyone, not even yourself. There will be men watching anywhere and everywhere you go, relentlessly. Are you absolutely sure you want to know this? Well, if you must insist. The truth is, even I am not certain of how to answer that question. Yes, it is believed to exist, but nobody can, to this point, be truly certain. Many would give their life to defend the theory of its existence, as quite a few have over the years. On the other hand, there is most likely an equally large group willing to do just the opposite. 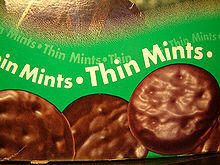 Personally, I do believe in the third Thin Mint; I will never deny this if directly questioned. No, I don't know what it looks like, or what it tastes like, or even what it feels like as it melts on your tongue. Assuming that it actually melts, of course; as I have stated, I don't know for sure. Yet I am convinced of its basic existence. The truth may never be known though. Government funding has been lacking greatly. Operation: Oh, bugger, what did they call it? Anyway, it has been receiving less and less support, and soon, we will not be able to use the troops to continue the search. However, personal contributions are always appreciated, if you feel the need to donate to the cause. Ahem, ahh, I do believe this is the end of the journey. I hope to be seeing you again soon. No? Very well then. Goodbye.